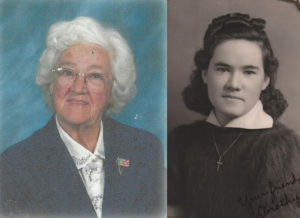 The Dorothy Bicandi Aldecoa Community History Project began when the family of Dorothy decided to donate funds from her estate to the Basque Museum & Cultural Center in her name. Dorothy had been a long-time volunteer and generous supporter of the Museum. She also loved history and people, and what better way to continue her legacy than with a project specific to that. The Dorothy Bicandi Aldecoa Community History Team, lead by Patty Miller and includes Toni Berria, Connie Urresti, and John Urresti with assistance by Carolyn Ruby, works to document history of the Basques, by community, throughout the West. This is being done by collecting information through research including church, city and state records and archives, but also by meeting with the Basque families in each community, interviewing them and assisting them in telling their own stories. They often share photographs, letters, and many other documents to assist in these efforts. The Basque Museum & Cultural Center is grateful for the family and legacy of Dorothy Bicandi Aldecoa for allowing us to create this project, but also to each family member and community that has allowed us into their lives for a short time to tell the unique stories and share them with the world. Thank you to our generous supporters! Without their passion and generosity, we would not be able to gather this research and share it with you all. Eskerrik asko biotzez – a heartfelt thank you! You can search the Dorothy Bicandi Aldecoa Community History by clicking on the State accordions below and searching by town. You can also scroll down and search by a specific person (this part is coming soon). Links will be created as soon as community pages are available so check back often! If you have any questions, please feel free to email or call the Basque Museum & Cultural Center. If you would like to participate or assist in any of this project, we would love to have your help! Give us a call! Information here about Basques of California and link to website.